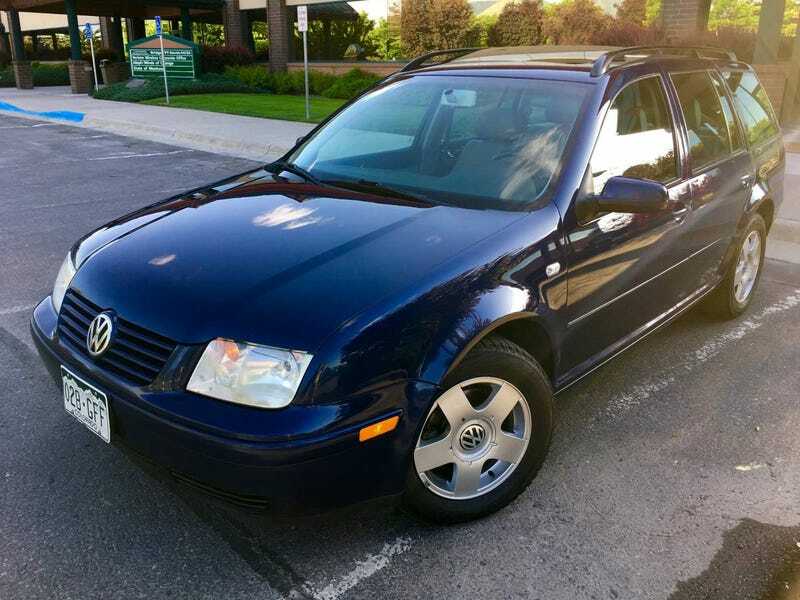 At $6,500, Would You Give This 2002 VW Jetta TDI Wagon a New Home? Today’s Nice Price or Crack Pipe diesel Jetta hits a lot of high notes. It’s a stick, it’s arguably the best looking Jetta model ever, and it’s reasonably neat and clean. The question is, will its price be music to your ears? It’s arguable that something seemed hinkey about yesterday’s 1965 Nissan Patrol and its remarkably modest $2,000 price. You all got the vibe too, and its 70-percent Nice Price win was tempered by comments like ‘a deal if it’s real, and a pox on the scammer if it’s not.’ It was evidently a righteous ad, and hence a righteous deal. Let’s go now from a vehicle that was suspiciously low priced to one that’s off the reservation—as in, didn’t meet its reserve on eBay. I want you to consider for a minute today’s 2002 Volkswagen Jetta TDI wagon. Not this specific car mind you (we’ll get to it in a sec) but the model in general. The MK4 Jetta, in either sedan or wagon bodystyle really nailed it in the looks department. This was the first Jetta not to share back doors with its hatchback sister, the Golf, and hence it was able to be further differentiated in style. Now, it’s my personal opinion, but I happen to think that, while the sedan is damn fine looking, it’s the wagon that takes home the design prize. The linear lines, airy greenhouse and uncluttered look make it a modern masterpiece. Okay, but looks are just part of the puzzle here. What about the mechanicals? Well, there, the Jetta is all over the board, and their apparent values reflect that. You can find clapped out gas engine/automatic gearbox examples for beer money. On the other hand, cars like this Galactic Blue Pearl over grey leather wagon with its ALH 1.9-litre turbo diesel and 02J 5-speed manual are the holy grail of Jetta seekers. The diesels bring more bank than do the gas drinkers, stick shifts seem to do the same over slushers, and wagons trump sedans by a good margin. Add to that this car’s seemingly decent appearance and laudable mechanical status and you’ve got a winner, right? Well maybe, but at what price would you say that win might be worth? The seller has had this car—ol Blue as he calls it—up on both Craigslist and the eBays for a while now, and he does not seem to have been able to move the metal. I’ve been watching the ads, and it’s not because of my weird German wagon fetish, to which I will gladly confess. No, it’s because I think these cars are on the upswing owing the the reasons I noted above, and wanted to see if this one, which seems to be one of the nicest on the market at the moment, bore that out. Over on eBay, the ad ended on Tuesday with the maximum bid being $6K, a number that failed to reach the seller’s reserve. The Craigslist ad is still up (at least while I’m writing this) and I’m guessing the car’s still for sale. Since that’s my story and I’m sticking to it, let’s kick some tires. The car is described as being in decent condition, with just some minor dings here and there, but overall it seems in acceptable, ‘I would drive it without embarrassment’ shape. Paint holds a reasonable shine and the glass looks good. Below that, factory alloys fill the wheel wells and seem free from curb rash. The interior is appreciably stock, right down to the factory cassette/CD stereo in the dash. The rest of the interior is lightly worn, with the light grey leather of the seating surfaces having taken the brunt from its age and use. This is a one-owner car, and the ad claims it’s spent its entire life ‘along the front range of Colorado.’ Rust does not seem to be a factor here. There are 192,000 miles on the clock, and before you freak out about that number, consider that another typical attribute of these TDI Jettas is their ability to go a ton of miles without much issue. There are others on the market right now with well over 300K on the clock. I’d say this one’s right in the zone. Okay, let’s get back to that $6,500 price tag. Would you spend that much on this seemingly tidy and well kitted TDI? If it really did sell for something close to that, did its new owner get a deal? Or, are these cars just overvalued at the moment and do you think everybody just needs to calm the eff down? Missoula, MT Craigslist, or go here if the ad disappears. At $2,000, Could This 1965 Nissan Patrol be For Real?